LSC Board Chairman John G. Levi (left) and Board Member Fr. Pius Pietrzyk, O.P. Note: The following is an excerpt from an op-ed by LSC Board Chairman John G. Levi and Board Member Fr. Pius Pietrzyk, O.P., published in the Richmond Times-Dispatch on May 20. The mission of the Legal Services Corporation goes to the heart of a fundamental American value: equal access to justice. This value is not just a lofty abstraction. Every day, legal aid attorneys across the nation assist low-income Americans who are confronting critical civil legal problems. They help women escape domestic violence, ensure military veterans receive fair treatment, protect the elderly from scam artists, respond to the needs of disabled citizens, and handle an array of requests for help in other civil matters. For the past 36 years, Congress, with bipartisan support, has appropriated funds for these purposes. But in April, Congress cut LSC funding by $15.8 million in the middle of the current fiscal year, immediately impacting 136 legal aid programs, including six LSC programs in Virginia. The LSC budget cut follows other funding reductions, particularly in state funds and short-term interest rates on lawyers' trust accounts (both down a total of $4.2 million in Virginia since 2007). This is not the time to reduce funding for civil legal assistance. If anything, funding needs to go up, and fairly dramatically, and not just from government but from other sources as well. LSC President James J. Sandman joined leaders from the American Bar Association and the National Legal Aid & Defender Association to discuss the historic collaboration among the groups during the closing session of the 2011 Equal Justice Conference in Las Vegas on May 21. During the discussion, Sandman praised the ABA and NLADA for the quality of their advocacy for the cause of access to justice. Other topics discussed during the session included the role of the ABA and NLADA in the creation of the Legal Services Corporation, the role LSC can play in convening stakeholders around the country and how national organizations can foster effective leadership in legal aid programs. Jo-Ann Wallace, president and CEO of NLADA, and Terrence J. Brooks, director of the ABA Division for Legal Services, participated in the discussion. Deierdre Weir, executive director of the Legal Aid and Defender Association of Detroit, facilitated the session. Click here to watch the full session or click here for more information on the conference. LSC President James J. Sandman received the Wings of Justice Award from the Tahirih Justice Center for his lifelong dedication to the promotion of pro bono and to women’s rights at the group’s Fourteenth Annual Benefit Fundraiser in Washington, D.C., on May 25. The Tahirih Justice Center is an Arlington, Va.-based organization with offices in Baltimore and Houston that is dedicated to protecting immigrant women and girls from violence through a combination of direct legal services, public policy advocacy and public education. The theme of the center’s May 25 event, Celebrating the Good Fellas, was about recognizing the important role of men in achieving justice for women. She described how, under Sandman’s leadership as a managing partner at Arnold & Porter LLP, the law firm was regularly ranked first among large firms for its pro bono work and often ranked among the best companies for women to work. “Jim ensured that women working at [Arnold & Porter] had adequate maternity leave, had part-time opportunities, and he built a day-care facility and pumping station inside the firm so that they could accommodate motherhood along with their legal careers,” Duperier said. To learn more about the Tahirih Justice Center, visit www.tahirih.org. Above: Danilo Cardona, director of LSC’s Office of Compliance and Enforcement, retired from LSC May 31. 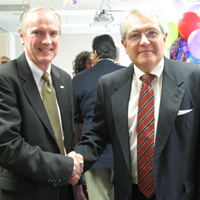 Below: Danilo, with LSC President Jim Sandman, at Danilo’s retirement party at LSC May 26. 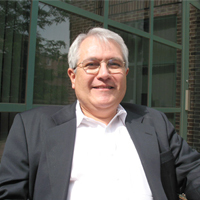 Danilo A. Cardona, director of LSC’s Office of Compliance and Enforcement, retired from LSC on May 31. Danilo served in the Corporation’s compliance unit for more than two decades, first as a staff attorney and senior attorney from 1989 to 1994, as assistant to the director until 1996, and as director since then. Born in San Pedro Sula, Honduras, in 1950, Danilo began his career as a diplomat in his home country’s foreign service, serving in posts throughout Europe and in Canada before coming to Washington, D.C., to work in the Honduran embassy and with the country’s permanent mission to the Organization of American States. After leaving the foreign service, Danilo stayed in Washington to begin a private practice in immigration law, allowing him to use his own experiences with America’s immigration system (he became a citizen in 1989) to represent clients. The experience turned out to be an early brush with legal aid, as his clients rarely could afford to pay him. In 1989, in his third year of immigration law, Danilo answered an ad for a staff attorney position with the Legal Services Corporation, thinking the job would allow him to continue representing clients, but within the stable confines of an established organization. But by this time, he was already enjoying his new job—visiting legal aid programs, learning about their work and travelling around the country to see how the rest of America “lives, thinks and goes about their daily lives. I was a very happy individual, having no managerial responsibilities,” he says with a smile. Later in his career, he was handed a weighty set of managerial responsibilities. In 1996, as the new head of LSC’s compliance unit, Danilo found himself in charge of implementing a new slate of congressionally enacted funding restrictions on LSC grantees. His first duty was to ensure that grantees divested themselves of class-action cases, prisoner litigation and cases involving persons illegally in the United States. Looking back on his career with LSC, Danilo is proud of establishing a compliance function that is gaining the confidence of Congress and earning the respect of LSC grantees for its professionalism and objectivity. Of his plans for the future, Danilo says he will be “in the pastures somewhere on this blue Earth.” He and his wife of 33 years, Cathy, a Canadian, plan to split their time between Washington, D.C., and Kingston, Ontario. Their immediate plans involve travel to far-flung regions, namely South Africa, India and China. Back at LSC, Lora Rath, the deputy director of the Office of Compliance and Enforcement since 2007 and a program counsel in the office since 2001, will become acting director of the unit. 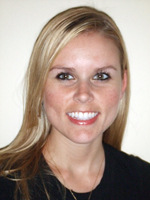 Holly L. Mowforth, a student at the New York University School of Law, has been selected as LSC’s 2011 Helaine M. Barnett Summer Fellow. LSC and the New York University School of Law are pleased to announce the selection of Holly L. Mowforth as the 2011 Helaine M. Barnett Summer Fellow at the Corporation’s headquarters in Washington, D.C.
Ms. Mowforth, a rising third-year student at NYU law school, brings to the fellowship academic and work experiences in public interest law. Last summer, Ms. Mowforth worked at the Florida Guardian ad Litem Program, where she developed trial advocacy skills in family court. During the fall, she participated in NYU’s Children’s Rights Clinic, serving as a legal intern in the Brooklyn office of the Legal Aid Society of New York’s Juvenile Rights Practice, which provides legal representation for children involved in abuse and neglect proceedings in family court. This year, she served as a legal intern with the Legal Aid Society’s P.E.A.K. program, a part of the Juvenile Rights Practice that focuses on providing educational assistance to children. The Helaine M. Barnett Summer Fellowship Program was established by LSC’s Board of Directors in December 2009, at the end of Ms. Barnett’s six years as the longest-serving LSC president. The program provides an opportunity for NYU law students to gain insights into federal funding for civil legal services through LSC and learn about the work of the 136 legal aid programs funded by the Corporation. Ms. Mowforth is the second Barnett Summer Fellow and joins LSC on June 1. LSC has issued a request for proposals for consultant services to support the work of the Development Committee of the Corporation’s Board of Directors. The committee was established in 2010 to explore opportunities for raising non-federal funds to help LSC carry out its mission. The panel is chaired by Board Chairman John G. Levi and includes four other Board members and three non-director members. The responsibilities of the development consultant would include attending committee meetings, developing and implementing a strategic fundraising plan, cultivating new funding sources for LSC and assisting in the creation of a Development Office. Proposals are due to LSC by the close of business on June 13. For more information, download the full request for proposals. Legal Services of New Jersey, with the support of the state's judiciary and the State Bar Association, went cap in hand to the Legislature on [May 23], asking for an increase in its proposed appropriation for the upcoming fiscal year. At the same time, Superior Court Judge Glenn Grant, the acting administrative director of the courts, said the judiciary will seek an increase in filing fees—the first since 2002—to help fund Legal Services and to implement its proposed mandatory, system-wide electronic filing program. The requests were made to the Assembly Judiciary Committee at a special hearing to discuss the financial plight of Legal Services, which has seen its appropriation from the state slashed over the past several years. Legal Services' overall budget has dropped from $71.5 million in 2007 to $47.6 million last year, said the organization's president and general counsel, Melville Miller. The sharpest drop in its source of funding came from the state. In 2007, the Legislature appropriated $29.6 million in 2007. But last year it appropriated only $19.9 million and Gov. Chris Christie has recommended the same amount for fiscal 2012. The remainder of Legal Services' funding comes from the national Legal Services Corp., which has had its own funding cut by Congress over the past decades, an ever-decreasing amount from the Interest on Lawyers' Trust Accounts program—where revenues have dropped from $40 million in 2007 to $7 million last year—and from individual donations. As a result, Legal Services has cut its staff of 720 to 490 from 2007 to now, and if additional funding is not forthcoming, Miller said another 75 staffers will be laid off in this calendar year. And because of the cuts, he said, two out of every three potential clients must be turned away. Money woes are forcing a non-profit legal aid outfit that helps thousands of Idaho's poorest residents to begin shuttering its offices on selected days. Idaho Legal Aid Services, which has already cut hours of its staff and 21 attorneys, has a $250,000 hole in its $2.6 million annual budget. Its leaders say employees at nine offices will now take forced days off without pay starting on May 27. If that's not enough, layoffs could be in the offing, said deputy director James Cook. Congress in April cut about $15.8 million from the federal agency that provides about 60 percent of Idaho Legal Aid Services' funding. And a bill in the 2011 Idaho Legislature that would have shored up its coffers died amid opposition from the Idaho Farm Bureau Federation, which has tangled with Legal Aid Services in the past over labor laws that govern migrant workers. Cook says the demise of this year's legislation kept Idaho as the only state that doesn't provide any funding for legal aid for poor people to get assistance with domestic violence cases, disputes with their landlords, foreclosures, child abuse and neglect cases. "The sad part about it is, the population that's eligible for our services has gone up," Cook said. "Part of the problem is, our budget has remained the same for a long time." In the large immigrant community of Jamaica, Queens, which is ground zero of New York City’s foreclosure crisis, a small squad of young lawyers fans out to local courts every day to do battle with lenders, negotiate hard-fought changes to onerous loans and provide free legal representation to low-income homeowners about to lose their homes. Now, however, the anti-foreclosure team itself is facing foreclosure. The state’s budget squeeze has put at risk more than 120 legal aid and homeowner-counseling agencies across the state that have provided a last-ditch legal and economic lifeline to thousands of distressed homeowners. A new study estimates that the four Louisiana legal services programs provide an economic impact of between $70 million to $107 million in total economic transactions to the state of Louisiana. Those same services contribute $2.9 million to $4.4 million to state and local tax collections each year. For every dollar spent, the study shows legal services programs return $1.55-$2.40 to the Louisiana economy. The study, conducted by Dr. James A. Richardson, alumni professor of economics at Louisiana State University, also estimates that legal services programs account for estimated personal earnings of $21.6 million to $33.2 million each year in Louisiana, and support between 851 and 1,309 jobs. At the request of the Louisiana State Bar Association’s (LSBA) Access to Justice Committee and its Gap Assessment Subcommittee, Dr. Richardson analyzed economic benefit data collected over a three-month period from the four Louisiana legal services programs, assessing the direct impact of federal funding to the programs and the new state and local taxes collected which results in net new spending in Louisiana’s economy. Download the full press release or download the study. An Alabama couple whose rented trailer home was totaled by the tornadoes that ravaged parts of the state in April wants their security deposit back. When the couple returned home following the storms, fallen trees blocked their entry into the house, so they cut out a window to get into their bedroom and collect what personal belongings they could. According to the couple, the insurance company says the trailer was a total loss after the storm, but the landlord is withholding their $500 security deposit, claiming the damage was caused by the tenants and not the storm. This story, from a May 22 article in The Anniston Star, is just one example of the type of legal problems faced by low-income Americans following a natural disaster and is illustrative of the murky legal territory that legal aid programs must wade through to help victims. David Webster, an attorney with Legal Services Alabama, told the Anniston Star that he expects to see more legal issues arise in the months to come, after the initial shock of the tornado wears off. He said landlord-tenant issues were one of the biggest areas of law handled by his office before the storm. It’s “absurd” to make a person on welfare learn how to write résumés if the evidence shows that they are unable to work because of a disability. That was the conclusion of the Nebraska Supreme Court in a ruling [May 13] that could impact other welfare recipients required to enroll in a job-training program despite their disability. “It’s a very positive decision for those who apply for assistance and are disabled and unable to work,” said Scott Mertz, the staff attorney for Legal Aid of Nebraska who brought the case against the Nebraska Department of Health and Human Services. The Nebraska Attorney General’s Office, which represented the state in the case, declined to comment Friday. The case revolved around Darline Liddell-Toney, a 36-year-old single woman from Omaha who receives assistance from the state. The state requires people on welfare to attend a job-training program. However, Liddell-Toney asked for an exemption, arguing that she was unable to work because of a degenerative disk disease in her back. At a hearing to consider the exemption, Liddell-Toney presented a report from her doctor that she could not walk without a cane and was limited in how much time she could stand and walk. The doctor also said she was unable to work because of her condition. The doctor termed her prognosis “poor” and said Liddell-Toney would require more than six months of treatment before she could complete the job-training program. The state denied Liddell-Toney’s request for an exemption and she appealed. In a 5-0 opinion, the State Supreme Court noted that there was no evidence presented by the state to contradict the opinion of Liddell-Toney’s doctors that she was disabled. “It would seem absurd to require an individual to participate in résumé writing and interview training activities if that individual is incapable of entering the workforce at the conclusion of the training sessions,” wrote Justice John Gerrard.